With the summer cinema season (very) slowly approaching, 2018’s blockbuster contenders are coming out to play. 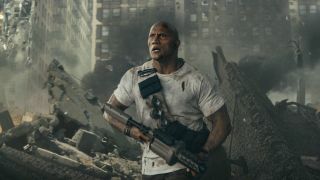 Arcade game adaptation Rampage is gearing up to be one of the biggest, smashiest films of the season. Rampage will be in cinemas on April 13, but you can read more about it in the latest issue of Total Film magazine, which hits stores on February 9. To make sure you’re always up to date with the latest movies, why not subscribe to Total Film? As well as saving money on the cover price, you’ll get the issue delivered to your doorstep every month, come rain, shine or monster invasion. Plus, you’ll get an exclusive subscriber cover that can’t be bought in shops.